“My 13-year-old daughter’s bedroom is so awful it looks like a tornado just ripped through it! When I ask her to clean it up, she either ignores me or throws a fit!” If this sounds like your child, you are not alone. 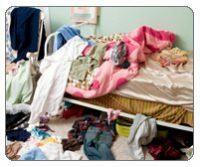 Many people who call parent coaching complain of rooms so messy they can’t walk through them, dirty laundry piled in heaps on the floor (along with the clean clothes) and garbage scattered throughout their kids’ rooms. It’s incredibly frustrating, to say the least, to deal with a child who is refusing to take care of her space. So what’s a parent to do? Read on for more information and ideas that will help. Note: If your child’s lack of cleanliness is coupled with behavior changes, declining academic performance, trouble with peers, or if he or she is functioning poorly overall, we recommend that you make an appointment with your child’s pediatrician to discuss what is going on and rule out a mental health issue. 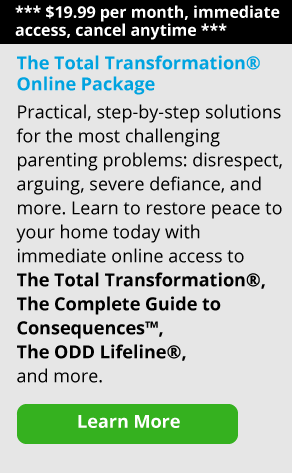 This article is intended to address children for whom mental health issues have been ruled out. With most typical children who refuse to clean their rooms, it comes down to this: they just don’t want to—and many kids are resistant to this task from time to time. It’s often more exciting to do something else, like watch TV or text their friends. Some kids get so immersed in a certain activity that it’s all they want to do. Look at it this way, if you’re faced with the choice of doing something you consider fun versus something that feels like a chore and is boring, which one are you going to choose? As aggravating as it can be, try not to take this behavior personally. Most kids go through a messy phase, but it has nothing to do with you or your parenting—and everything to do with them. When should you just “shut the door”? 1) Divide and conquer. First of all, if your child’s room is a complete wreck that you can barely walk around inside of it, it might be really helpful to divide the room into quadrants and have your child work on one quarter of the room at a time. Or, have her focus on one item at a time—first trash, then clothes, then toys. Breaking a large task down into smaller pieces is helpful for any child. Put yourself in your child’s shoes and think about how she might see it: she might not know where to start and might be thinking, “Wow. I am never going to be able to get this done. What’s the point in trying?” So break it down and work at it using small steps at first. 2) Give “hurdle help.” Another thing to consider is hurdle help. Young kids especially might truly need you to help them get started. It’s okay to spend 15-30 minutes in the room with your child, depending his age, where you show him the steps required to complete the task. For example, you might teach your child to pick up the clothes on the floor, inspect them, and then either put the clothes in the hamper or put them away. It’s very important that kids know exactly what your expectations are. Many times we think they know how to do certain tasks, but they honestly don’t—they need to be shown the ropes first before they really get it. Hurdle help allows you the opportunity to role model a little bit for your child, which clarifies what you’re looking for in a way that doesn’t result in you cleaning the room for him. 3) Don’t be a martyr. That brings me to my next point about rooms: if your child is old enough to do it herself, don’t clean your child’s room for her. Stepping in and cleaning your child’s room on your own actually works against you. It shows your child that you don’t think she can do it on her own and that if she drags her feet and resists you enough you will give in and do it yourself. It might even show her that she doesn’t really have to do what you say—that what you say isn’t what you mean. Make no mistake, when kids get that message, your authority is in jeopardy. Sure, doing it yourself might seem easier, but in the long run it will simply contribute to your child’s lack of motivation around this chore. The rule of thumb is that once kids are in elementary school, they should be able to do most of the tasks involved in cleaning their rooms on their own. You will just need to hold them accountable. The bottom line is this: Sometimes you can give kids every opportunity to accomplish something and they will still decide not to do it, and that’s on them. Your job is to provide the skills and the opportunity. Kids will always make their own choices no matter what; as long as you are problem-solving with your kids, using rewards and consequences to motivate them and hold them accountable,as well as supplying them with the necessary ‘tools’ to take care of themselves and their space, that’s the best you can do.